COAR has partnered with ECONortwest to produce accurate and in-depth analysis of each of our markets on a quarterly basis. Click here for a copy of the report for 2018. Click here to apply for a donation from COAR for 2019. Please note there is a deadline of April 1 for monthly beneficary applications and September 13th for annual giving applications. -Applicant must be a 501(c)3. -Applications are preferred from, but not limited to, to smaller organizations that provide basic needs to the community, such as food, shelter, clothing and medical services. -Political organizations/campaigns, religious activities (religious organizations are eligible for community services), sports teams or individual activities are not. -Funds must be used for programs and not events or marketing. -Programs must take place in Central Oregon. -A letter of recommendation from a COAR member. Google’s recent version update for the Chrome® web browser may be preventing MLS pages from loading when the MLS system attempts to open a new window. To allow new windows to load properly, users must authorize pop-ups for their Rapattoni MLS site. If a new window fails to open, click the pop-up blocker icon located in the web address bar (shown below) and select the “Always allow pop-ups and redirects from…” radio button. Click the “Done” button to save.-A letter of recommendation from a COAR member. The EnCOAR Awards celebrate a REALTOR®, Affiliate and Rookie of the Year that have given above and beyond to the real estate industry. Additionally, the to the Commercial Transaction of the Year and the WCR member of the year are presented. Nominations will be accepted through February 28, 2019. The event will be held April 18th at Tetherow Resort. A REALTOR® Member who has held membership in the National Association as a REALTOR®, REALTOR-ASSOCIATE®, or both, for a cumulative period of forty (40) years is eligible for REALTOR® Emeritus status. -Applications submitted in the years 2015 through 2019 will require proof of one (1) year of service* at the local, state, or National Association level. -Applications submitted in 2020 and beyond will require proof of one (1) year of service* at the National Association level. April 2, 2019 is the deadline to complete certification forms for REALTOR® Emeritus status. New Principal Brokers will have a different renewal process they first time they renew their license. The Advanced Practices for Principal Brokers is also highly recomended for all Principal Broker renewals, especially those looking for more relevent education to being a managing broker. -Complete a 3 hour Law and Rule Required Course (LARRC) from a Certified Continuing Education Provider, every license period. -Go to eLicense to renew your license and pay renewal fee. Tax time is here! REALTOR members receiving up to $20 off on TurboTax, the #1 best-selling tax software. This benefit can also be shared with staff and family of NAR members! Click here to read more. Save your seat for the 2019 REALTOR® Broker Summit. The 2019 REALTOR® Broker Summit will offer an incredible two days of learning, innovative ideas, and networking! Hear from and collaborate with industry experts, tech entrepreneurs, and top brokers who understand business and offer real, actionable ways to position your brokerage for success. Visit the official Broker Summit site to learn more about the REALTOR® Broker Summit (April 2-3), and stay connected with NAR on the latest speaker lineup and event updates. Register before March 11 to receive the early bird rate of $249*. Reserve your spot now! *After March 11, registration price will increase to $299. 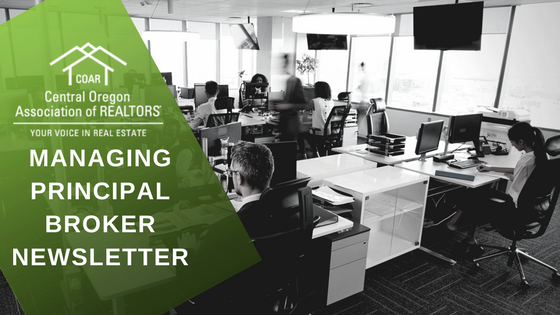 Register now for the 2019 REALTOR® Day at the Capitol, April 2 in Salem. COAR will be offering a bus to take REALTORS® to Salem with stops in both Bend and Sisters. The bus will leave the COAR office in Bend at 6 AM, and will meet members in Sisters at 6:30 AM at Ray’s Food Place. The bus will leave Salem at 5:30 PM to return to Sisters and then Bend. Breakfast, lunch and dinner are provided. Please note: If you have already registered with OAR for REALTOR® Day at the Capitol and plan to ride the COAR bus, registration with COAR is also required to ensure we have enough space on the bus. REALTOR® Day at the Capitol is a valuable opportunity to meet your elected officials and advocate for your business and industry on key issues such as legislation to establish a statewide rent control program. On February 7, the Bend Chamber welcomed over 500 attendees for a discussion about disruptions to the buying and selling process and the way we live. James Dwiggens, CEO of NextHome and a 2019 RIS Media Real Estate Newsmaker, gave the crowd a reality check on the future of our industry. What income is included in the calculation of the new 20 percent business income deduction? As an independent contractor or sole proprietor, you’re eligible for the deduction—part of the federal Tax Cuts and Jobs Act enacted last year—but do you know whether to take it before or after you account for marketing and other business costs?